You know what’s better than writing about beans? Writing about beans while a Crock Pot full of them stews on my kitchen counter. Last week, I confessed my love of beans and all their benefits to my health and wallet. Now it’s time to share a few of my recipes. 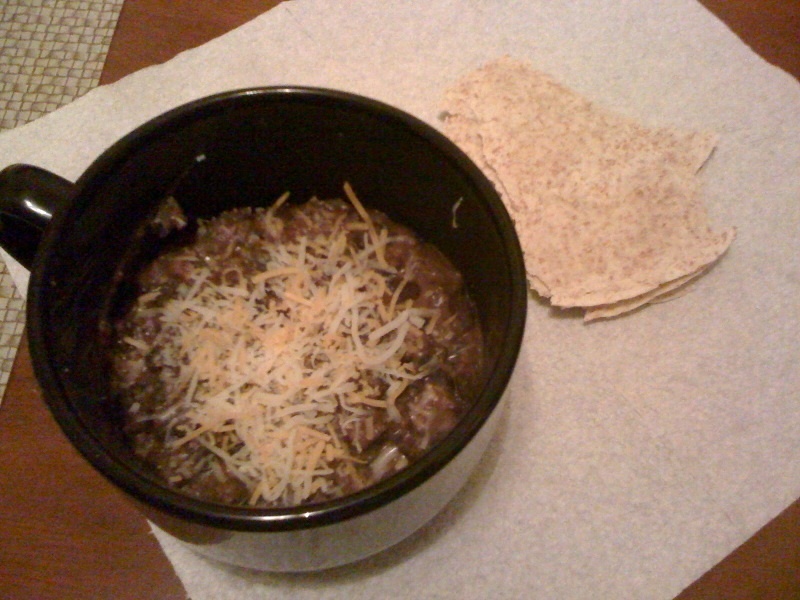 First up, black bean soup. I was inspired by this post from Serious Eats, and I’ve added a few of my own touches. I recommend added some shredded Mexican blend cheese and some sour cream to this hearty soup. It’s also good with a tortilla on the side. Heat oil over medium heat in a large pot. Add onion and green pepper. Sauté until starting to soften, about 5 minutes. Add garlic, cumin and chili powder and cook 1 minute, stirring frequently. Add black beans, bacon and broth. Stir to combine. Bring mixture to a boil. Reduce to a simmer, and cook 20 minutes. Use an immersion blender to puree half of the soup. (If you don’t have an immersion blender, I highly recommend buying one – they are pretty handy. In the meantime, pour about half the soup into a blender and puree until smooth. Return the pureed soup to the pot.) Stir until both parts of the soup are combined.